As a self-taught director and general film lover, Quentin Tarantino has paid homage to various genres throughout his career. While his specialty is crime (Pulp Fiction, Reservoir Dogs and Jackie Brown), he has also tried his hand at supernatural horror (From Dusk til Dawn), grindhouse (Death Proof), Asian cinema (Kill Bill) and war (Inglourious Basterds). It was no big surprise that he would eventually pay tribute to the classic Western. With Django Unchained, his adoration for Westerns shines brightly, complete with long horse riding montages, landscape scenery, gun-slinging heroes, redneck villains and haunting country hymns. The reason Django is considered an original piece as opposed to a simple tribute is because Tarantino stays true to what his fans love – witty dialogue, over-the-top violence, an awesome ensemble cast and a killer soundtrack. 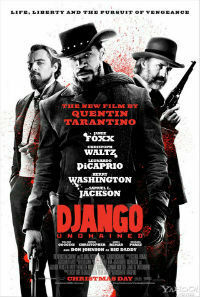 It tells the story of Django (Jamie Foxx); a slave rescued by a bounty hunter (Christoph Waltz) and offered freedom in exchange for information. After forming a friendship, the bounty hunter agrees to help Django find and rescue his wife, who is now a slave of the infamous Calvin Candie (Leonardo DiCaprio). Originally Tarantino wanted Will Smith for the title role and while I’m glad that never happened, I was equally unimpressed with the casting of Jamie Foxx. I haven’t liked Foxx since watching him over-act his way through The Soloist to milk an Oscar – but that being said, he was actually pretty decent as a broken man transformed to a natural born killer. Leonardo DiCaprio has to be the most bankable actor in Hollywood these days – it’s hard to think of a bad performance from him. And while his role is not very big, the time he has on screen is memorable. But as with Inglorious Basterds, this is Christoph Waltz’s movie. Like John Malkovich in his prime, you find yourself drawn to every line of dialogue and playful mannerism in absolute awe. It’s going to be a really close call at the Oscars this year, particularly in the Supporting Actor category, but hopefully he wins again. Even the most minor roles are filled with fairly big names. Sam Jackson’s role is brief but effective, Kerry Washington doesn’t say much for the whole thing, Jonah Hill pops up for about two seconds (in the funniest scene of the whole movie) and Tarantino does his usual cameo, complete with a cringe-worthy Australian accent. One thing that completely baffled me while watching this was that James Remar, who plays Dexter’s dad in the TV series, shows up in two different roles. I was expecting an explanation at some point but it’s never raised. According to the web’s biggest film nerds, this is QT’s homage to old Westerns that couldn’t afford to fill minor roles with different actors. As usual, Tarantino has compiled an impressive soundtrack to accompany the ride, mixing traditional Western with contemporary rap and soul tracks. The music definitely enhances the overall film experience but unfortunately it’s not to the standard of the Pulp Fiction or Death Proof. You probably wouldn’t listen to this soundtrack in your spare time. 1) The excessive racial slurs and violence – it’s expected in a Tarantino film but I don’t think all of it was necessary. Mostly used for shock value and to piss off Spike Lee. 2) The length of the film. You could break this film down into three acts: the set-up, the climax and then an extended ending that wasn’t really needed. Still, this is definitely one worth watching. It’s the best Western since 3:10 to Yuma, and on a scale of Tarantino films, it’s better than Inglourious Basterds but not as good as Kill Bill.